Without a doubt, Tohru Honda is the single most important person to ever meet the Sohma family. She may be the onigiri outsider in the fruit basket, but she is one damn important riceball. She manages to charm the entire family and help them heal their scars, and not because she wants to do it for personal gain, but because she truly cares. 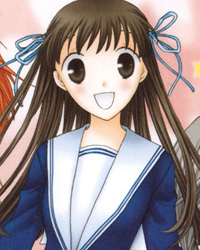 Yuki is no exception - Tohru plays an essential part in his life that changes him forever. Fruits Basket, in both anime and early manga chapters, goes fairly heavy on the Yuki/Tohru pairing. And not without good reason! Yuki's attitude towards Tohru in the beginning can be perceived as romantic interest. Anyone who's read the manga, however, knows that Yuki/Tohru the pairing dies quite solidly over the course of the series, but their real relationship - surrogate mother and son, as Yuki comes to realize - is much more beautiful than any romance they could have had. Yuki's relationship with Tohru ties in quite importantly with his relationship with Akito, as they play almost polar opposite roles in his life. It's difficult for me to separate the two at all, but I've attempted to break it down to what's most relevant to Tohru, though the writing here will constantly make reference to Akito's section. Below I dissect Tohru and Yuki's relationship chronologically - not in the order that it's revealed, but in the actual sequence of events.